Black Ice Software - Print2RDP version 6.22 is released! Black Ice Software has released the version 6.22 of Print2RDP. The latest version includes major performance improvements for attaching the printers to the server computer. The latest Print2RDP is able to attach the printers at a 50% faster speed than version 6.20. 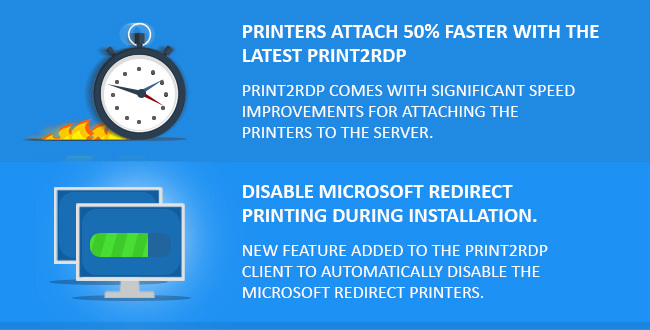 This new release of the Print2RDP Client also includes a new feature to automatically disable the redirect printers in a Remote Desktop Connection. This new feature significantly improves the user-friendliness of Print2RDP by helping to prevent users from utilizing the Microsoft redirect printers, built into Microsoft Remote Desktop Connections. Stability improvement to Print2RDP Server installer for Windows Server 2008 64-bit and Windows 2003 64-bit operating systems.